Ciarán Fallon, Dublin City Council’s Cycling Officer, has a wintertime and a summertime commute. In wintertime, the Cycling Officer commutes from Portobello with a detour through Ranelagh, to bring his daughter Molly to school. Six year old Molly sits in the child seat between the Cycling Officer’s arms. Up this close, father and daughter casually chat while cycling through morning traffic. And even though they ride a city bike the father describes as an old banger, his daughter loves the ride; and refers to that same vehicle as the Molly and Daddy bike. In summertime, when Molly has her school break, the Cycling Officer commutes on a sleek black folding bike. It’s a practical bike: at home he stores it under the stairs of his terrace house, at work he stores it under his desk. The summertime commute also starts in Portobello, where the Cycling Officer has lived over the past ten years, in various houses. 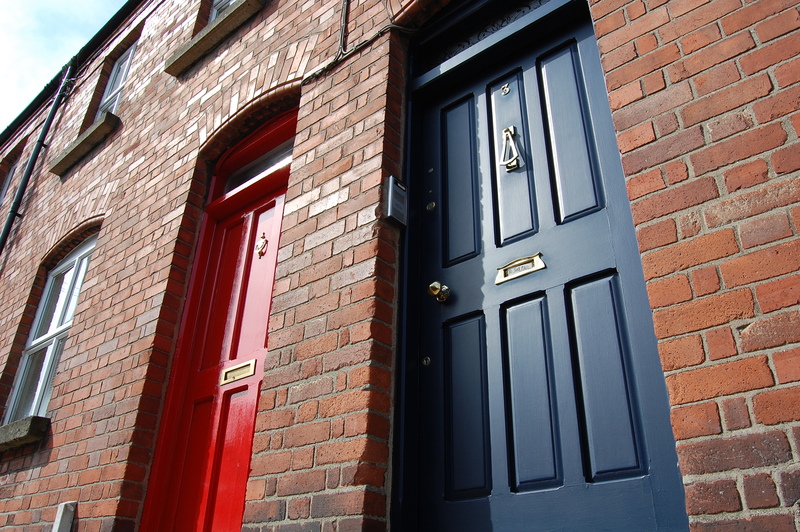 He loves to start his journey weaving through this red neighbourhood, via Lennox Street, onto Camden Street. 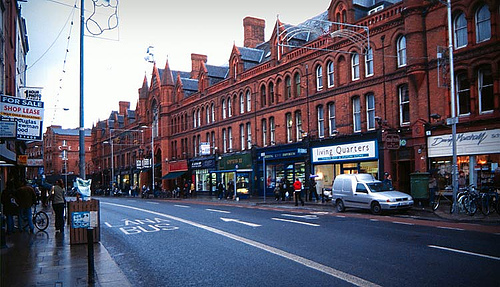 Camden Street – where you can buy anything from an anchor to a needle – is his favourite street in Dublin. There’s always something to look at in the charity shops, deli’s and boutiques. But where Camden Street meets Cuffe Street, the Cycling Officer becomes extra alert to traffic. From his work experience, he knows this junction should be approached slowly. Unloading lorries, busses, cyclists, and pedestrians all converge at this point. 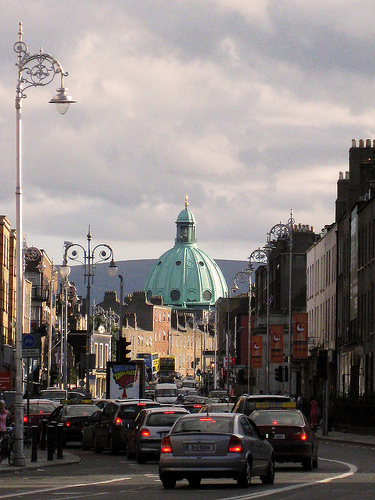 It is where you see Dublin is still a recovering car city. The Cycling Officer continues his journey through South Great Georges Street. Past the Long Hall, Hogan’s, Shebeen Chic. This street is the City Council’s model for Dublin’s future; 15% of traffic participants are cyclists and in 2020, all of Dublin should be like this. Finally, having conquered the steep ascent on Dame Street, the folding bike’s small wheels creaking with the effort, the Cycling Officer is rewarded with a view of Christchurch. 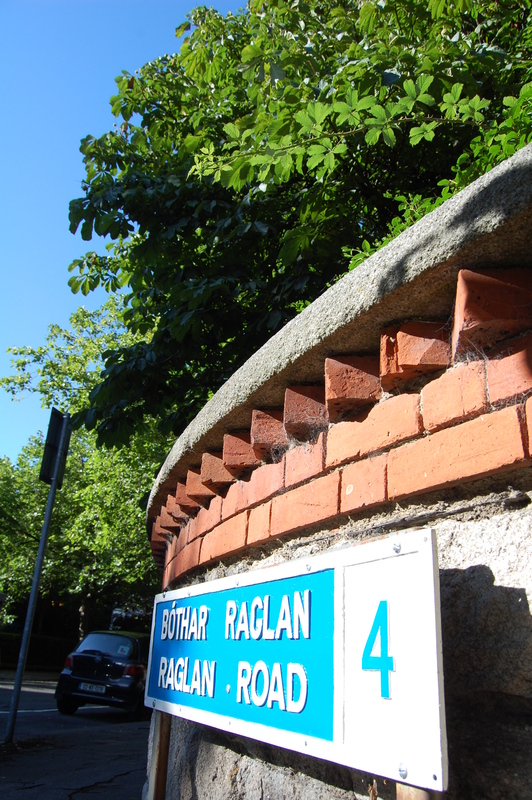 And with a comfortable downhill glide down Fishamble Street – right into his office. When you throw litter on the street, you’re liable to get a fine. 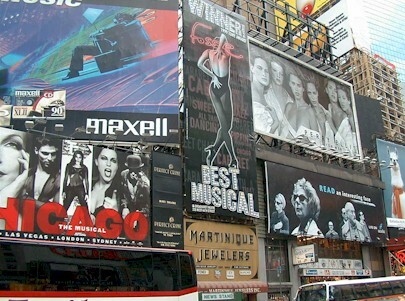 But when – as a business – you throw a billboard across a view, you’ll most likely be richly rewarded. Since advertising is such big business, we have messages invading our lives to the point where children refuse to eat anything that hasn’t danced on TV. It is something we cannot avoid. We can, however, avoid billboards spoiling our views. When visiting Amsterdam last week, we saw nice examples how this is done: billboards on bicycles. It’s advertising’s next frontier, and we’re thrilled by it. Not (only) because we operate a bicycle business and see an opportunity, but because with advertising like this, billboards become movable, don’t spoil the view, and bring colour and coolness to the urban landscape. 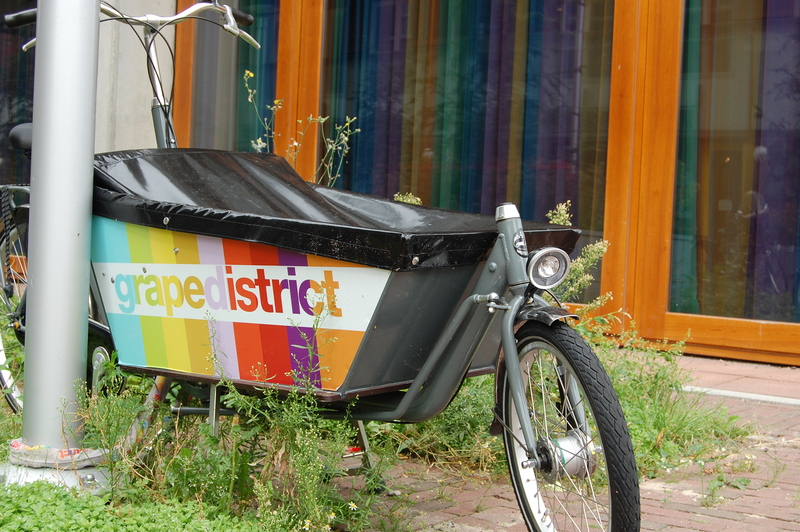 GrapeDistrict (an Amsterdam wine boutique – www.grapedistrict.nl) operates a delivery bike with a design that emulates the wines it sells. 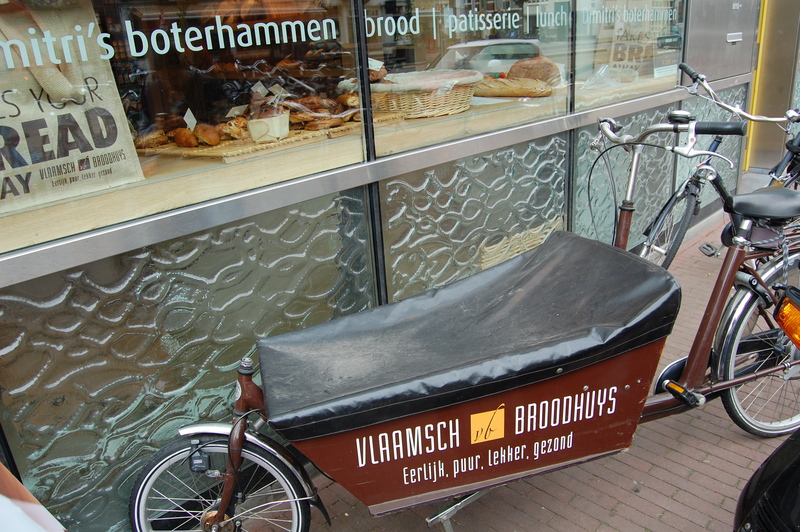 And the Flemish bakery Vlaamsch Broodhuys uses their house style delivery bike to bring loaves through town. Granted: you’re still exposed to businesses trying to convince you to buy their product. However, we believe that one of the greatest dangers of advertising is not that of misleading people, but of boring them to death. With billboard bikes, at least, that danger seems mitigated. We were visiting Nivelles; a rural town south of Brussels. The Belgians – like the Dutch – appreciate a functional way of cycling. This traffic sign nicely portrays Belgium’s view on a cyclist crossing. 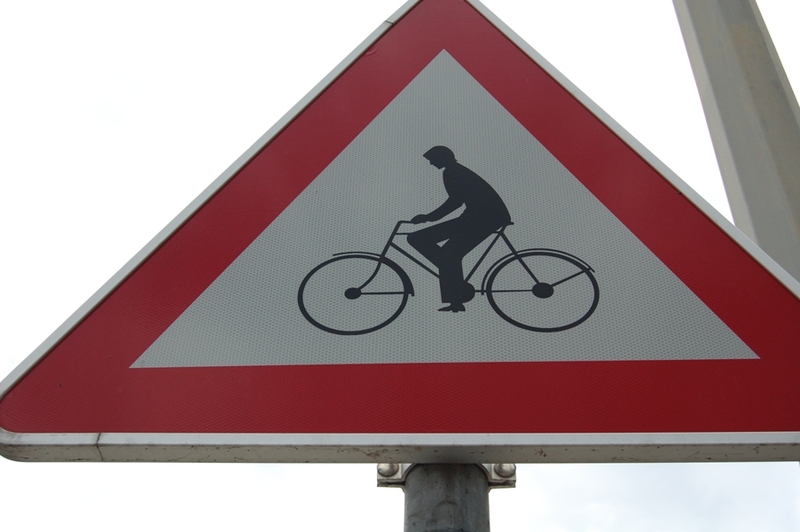 The cyclist pictogram reveals that the typical Belgian cyclist has long trousers with a 70’s style bootleg. To prevent the flares from getting caught, the Belgian cyclist has a chain guard and mudguards mounted on his bike. Finally, the Belgian cyclist has semi long hair, with a waving lock just above the collar. Apart from the hair, of course. 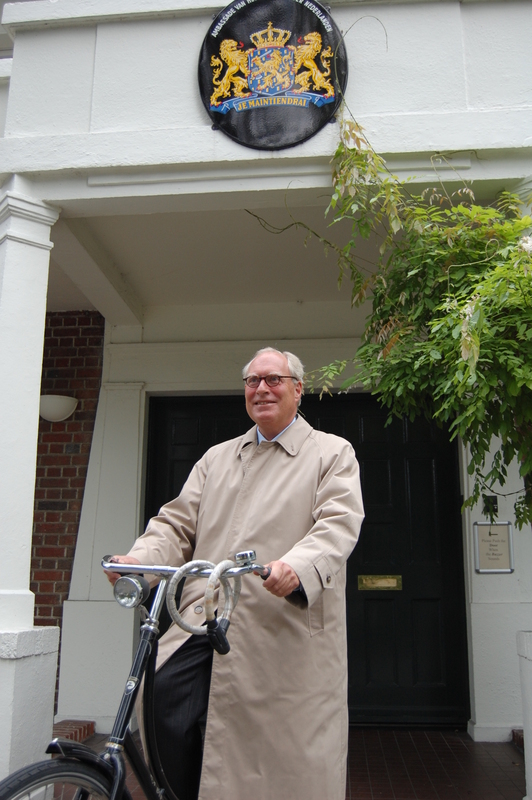 On a typical morning, the Dutch Ambassador descends from the five steps leading to his Residence. He walks onto the driveway’s red gravel and reaches for his keys. He inserts them in the lock, swings up his leg, and rides into traffic on his Dutch black bike. The leafy roof of Leesson park provides shelter for the first seconds of the Ambassador’s journey. 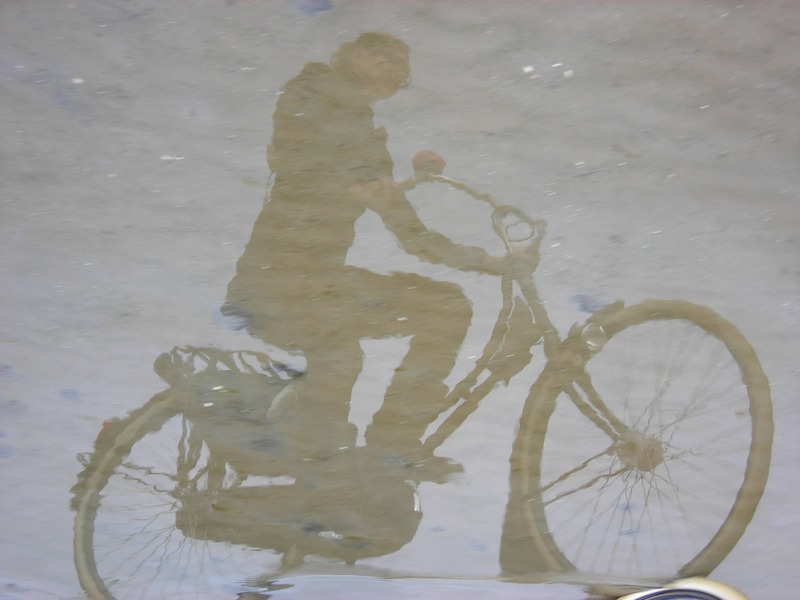 It gives him time to adjust to the climate conditions – be it rain or sunshine. This close to home, the SUVs waiting on traffic lights honk their horns in familiar recognition, as the Ambassador cycles past. For a brief moment, traffic becomes dense on Leesson street. The Ambassador is undaunted. He is, in fact, pleased how bus drivers have become more considerate to cyclists. He has even written a letter to the City Council, to extend his compliments on the matter. Soon, the Ambassador veers off to the left, to cycle through Raglan road. He likes Kavanagh’s ‘quiet street’, and will cycle through it even if it takes him a bit longer. Finally, turning right on Merrion road, it’s a straight stretch to the Embassy. Having arrived there, the Ambassador stands up on one pedal, swings his other foot over the saddle, and lets it rest behind his standing leg. Without its engine, the bicycle slows down, rolls the final yards on built up speed, and then comes to a standstill, next to a long, graceful flag post. 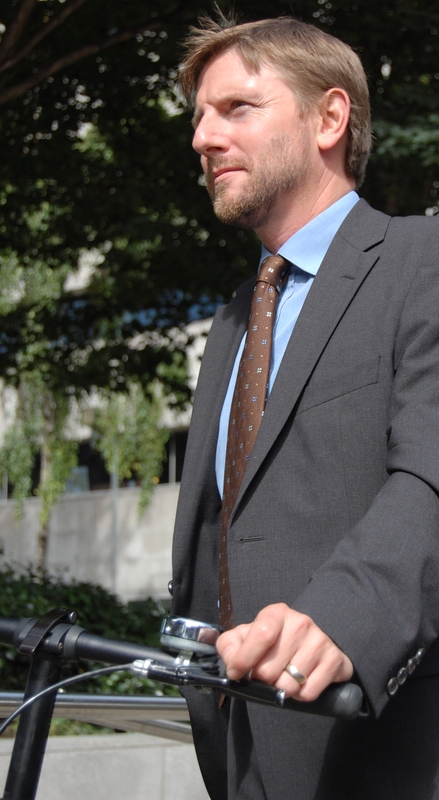 The Ambassador steps down, locks his bike against the pole, and briskly walks inside. His bike and his nation’s flag stay behind; ready to greet the day’s guests. 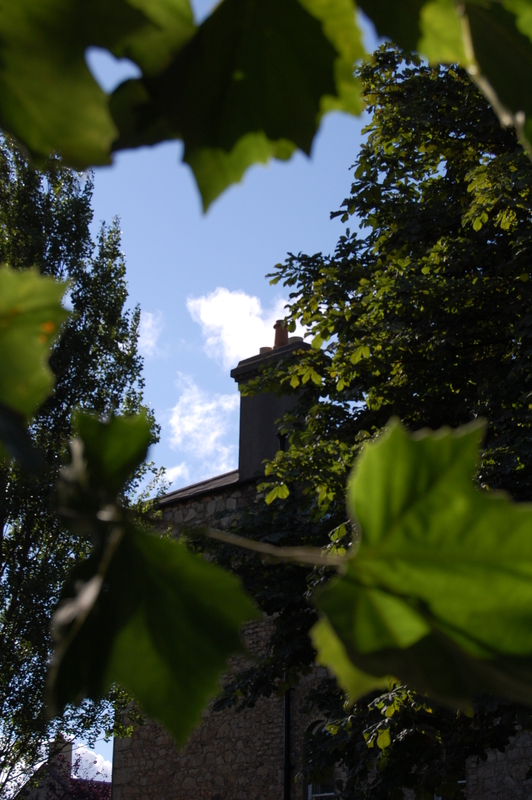 A Thursday evening in summertime. It had been raining during the day, but as the sun started sinking, the rain started lifting. Sandymount Strand was at low tide. The dry sand stretch closest to the promenade –uncovered by sea water even at high tide – was damp from the rain that had fallen earlier that day. 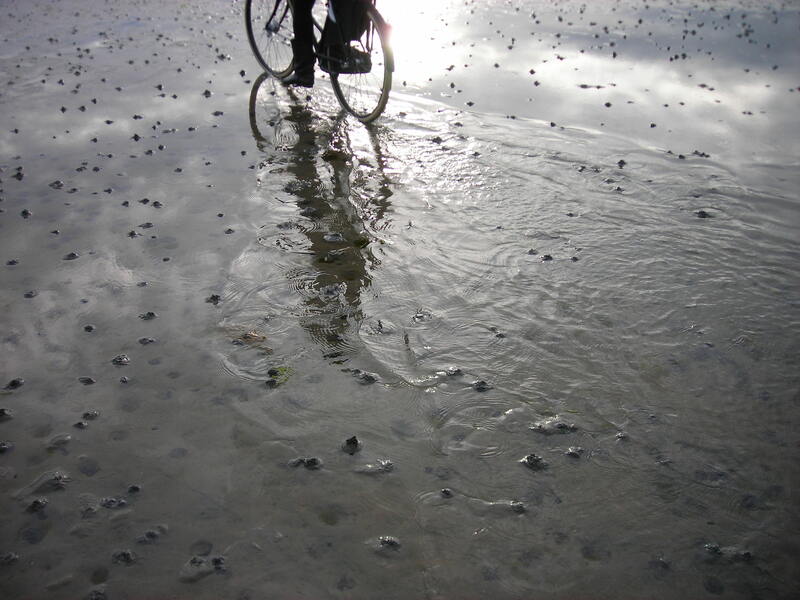 The dampness had solidified the strand, turning it into a boundless bicycle track. 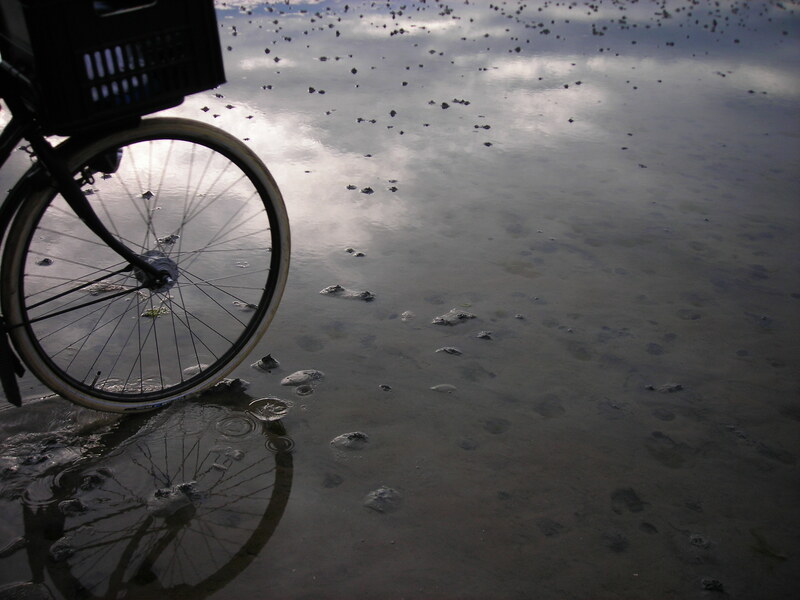 The small sand ridges left behind by the receding tide caused vibrations through the bicycle’s frame. 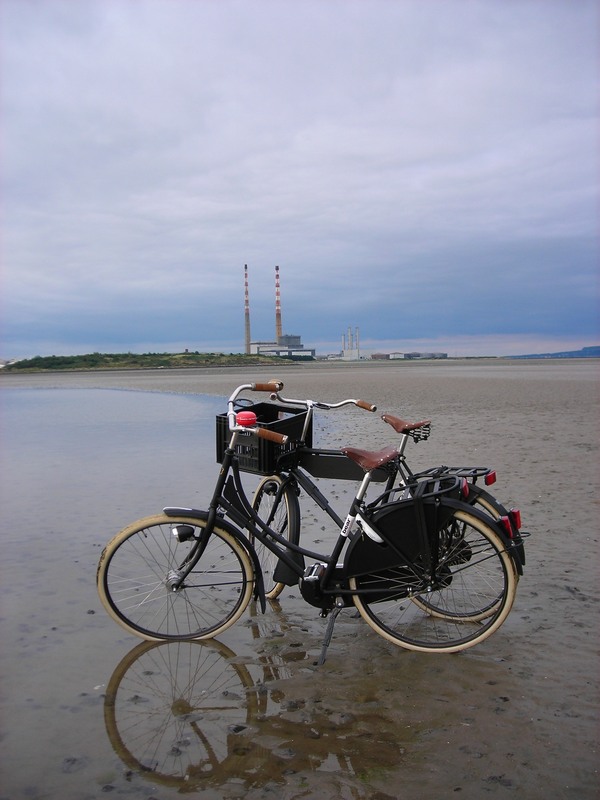 As we were riding towards sea, with Poolbeg’s Chimneys on our left, the sun’s rays tranquilly reflected in the mirror like puddles. Our wheels were the only thing disturbing them.